Protein is an essential nutrient, responsible for multiple functions in your body, including building tissue, cells and muscle, as well as making hormones and anti-bodies. Everyone needs protein in their diet, but if you do endurance sports or weight training you may benefits from increase your protein intake, as well as factoring it into your training routine at specific times to reap its muscle-building benefits. Studies also suggest that as we get older we may benefit from eating more protein because it helps minimise the muscle loss associated with aging. For most people a daily dose of around 0.8-1g of protein per 1kg of body weight is recommended. For weightlifters and strength athletes 1.4 – 2g of protein per kg of body weight is recommended per day, with a recommendation of 1.2-1.6g of protein per kg of body weight per day for endurance athletes. After exercise, protein is particularly important since muscles need it to recover and grow. A portion of protein (15-25g) is recommended within 30 minutes of exercise, when your muscles are particularly receptive to protein synthesis. For most of us, our daily protein requirements are easily achieved by a healthy, balanced diet. The Department of Health advises adults to avoid consuming more than twice the recommended daily intake of protein (55g for the average man and 50g for the average woman). This is because, in the long term, consuming too much protein might lead to health issues such as an increased risk of osteoporosis and a worsening of an existing kidney problem. However, research in this area is mixed and it is likely that other factors may influence outcome, such as whether the protein is of animal or vegetable origin and how balanced the diet is in terms of vitamins and minerals. One of the main issues with our Western diet is that often, our breakfasts and lunches are low in protein but high in carbohydrates, with a protein-packed evening meal. It is better to aim to spread your protein intake out throughout the day. 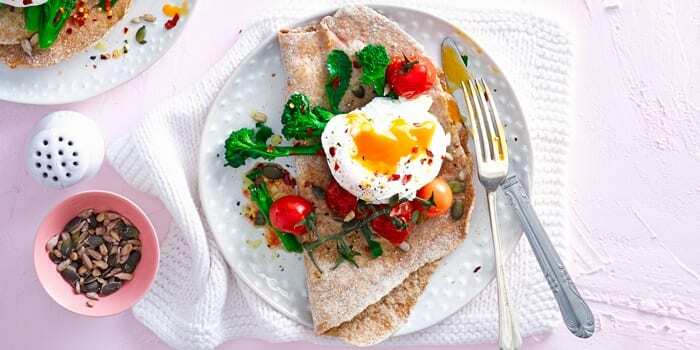 Try our suggestions for high protein breakfasts, high protein lunches and high protein dinners. You can get protein from both plant and animal sources - here are some of the best food sources of protein. We love to cook with them, but how much protein is in an egg? One medium egg has around 6g of protein in an easily digestible form. A healthy omelette is a good way to start the day and is a good recovery snack too. Try our healthy egg recipes and read about the health benefits of eggs. Dairy foods are packed with protein and contain bone-building calcium, too. Chocolate milk is the age-old recovery food after exercise, since it contains energy-replenishing carbohydrates and a blend of both slow and fast release whey and casein proteins. You can get the same recovery-boosting effects from a milk-based fruit smoothie - such as this cranberry & raspberry smoothie recipe. Read more about the best calcium-rich foods. A combination of casein and whey protein, yogurt is a great protein-rich food. Since most of the lactose is removed, it can work for most people who are lactose intolerant. Try making your own healthy bio yogurt. Fish and seafood are good sources of protein and are typically low in fat. While slightly higher in fat than other varieties, salmon packs in heart-healthy omega-3 fatty acids which can reduce joint stiffness and inflammation. 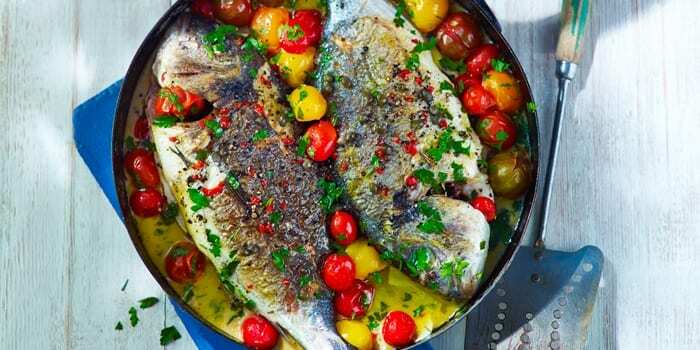 Try our favourite healthy fish recipes and read more about the health benefits of salmon. Opt for lean protein from white meat poultry such as chicken and turkey. Try our healthy chicken recipes and healthy chicken breast recipes. If you’re dairy intolerant, eating soya protein foods such as tofu and soya-based drinks will help post-recovery, plus they can help to lower cholesterol and may reduce the risk of heart disease. Read more about the health benefits of tofu and the health benefits of soya. Nuts and seeds are a practical protein choice if you’re on the move. Around 50 pistachio nuts provides 6g of protein, plus sodium and potassium, the electrolytes lost in sweat during exercise. This clementine & honey couscous recipe with pistachios makes for a great breakfast or speedy snack. Read more about the health benefits of nuts. Pork contains branched-chain amino acids (BCAAs), which are key in supporting muscle recovery. Leucine, in particular, makes up one third of muscle protein and helps to stimulate repair after exercise. 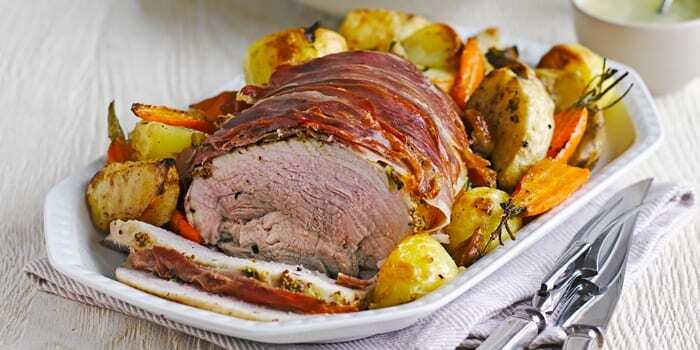 Pork is one of the richest sources of leucine and therefore a great addition to a post-exercise meal or snack. 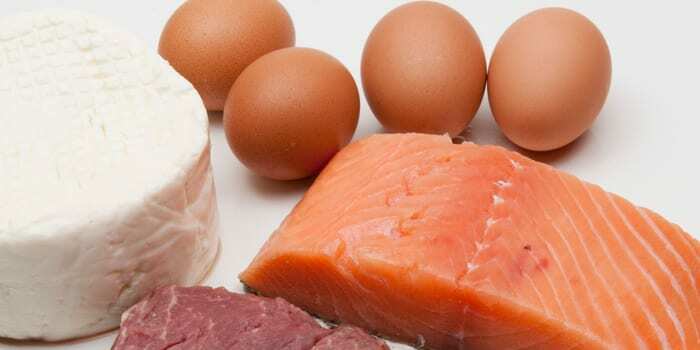 Eggs, chicken and lean beef also provide good amounts of leucine. Try our healthy pork recipes. Beans and pulses are great, cheap protein sources. They are also a good source of iron and fibre. Try our favourite lentil and chickpea recipes. This article was last reviewed on 21 July 2017 by nutritional therapist Kerry Torrens.